This necklace combines both warm and cool colors, gold and silver, yellow gold, and blue grey. the necklace contains the designer's hand-gilded 23-Karat gold leaf on volcanic stone with silver, bronze and copper in the stone showing through. 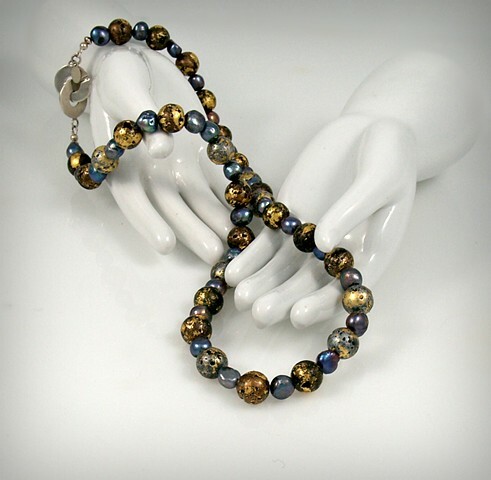 The blues and greys, and even copper in the freshwater pearls is a lovely accompaniment. The necklace is finished with a unique 2 circle sterling silver clasp along with the artist's signature tag. The clasp may be worn in front or off to one side for a different look.